If you've ever said to yourself: Self, what I need is a car that looks like something from a Richard Scarry book, accelerates like a big wheel, handles like a roller skate, and is as safe as a skateboard...well...you are in luck, because we've got a JDM thing for you today. 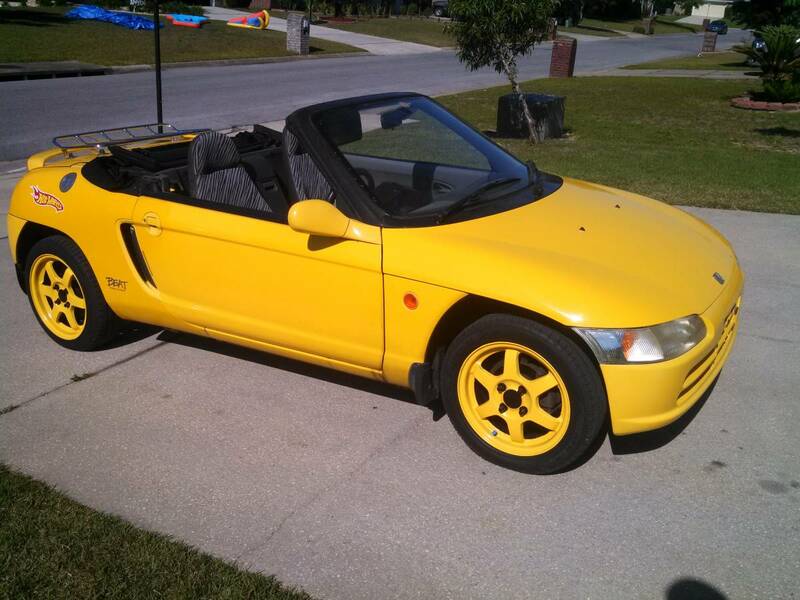 Find this 1991 Honda Beat offered for $5000 in Pensacola, FL via craigslist. Tip from Rock On! Right hand drive, 3-cylinder, 63 HP, mid-engine, 5-spd. Yes, it's small. And stupid fun to drive, gets lots of attention. New clutch, top, timing belt. Aftermarket exhaust. Plasti-dipped Volk Racing wheels (gloss black underneath) with excellent tires. 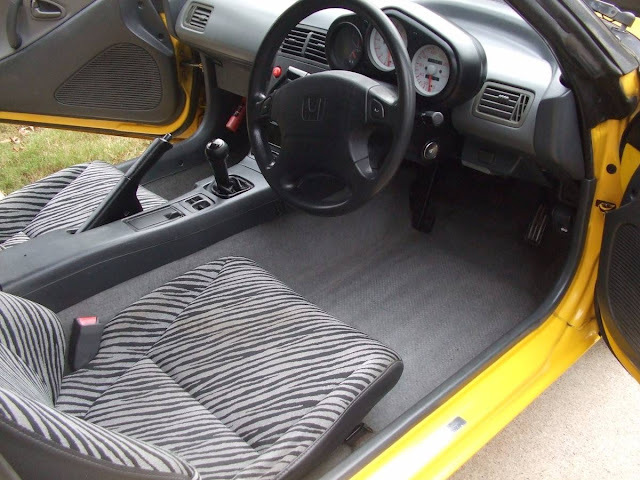 Very good rust-free body and interior with original Zebra upholstery and mats. Includes new set of black leatherette seat covers and excellent set of original wheels and tires. Full set of manuals (hope you can read Japanese). Runs and drives great, but has an intermittent rattle from the engine compartment. It's not rods or main bearings, those were inspected when clutch was replaced. I suspect idler bearing or water pump, but really not sure and don't have time to mess with it. I wonder if you could hook up a hood tachometer to the 3 cylinder engine? Sure, you just need to be good at doing math on the fly: 9000 rpm x 8/3 (or is it 3/8?) oh hell, SHIFT! 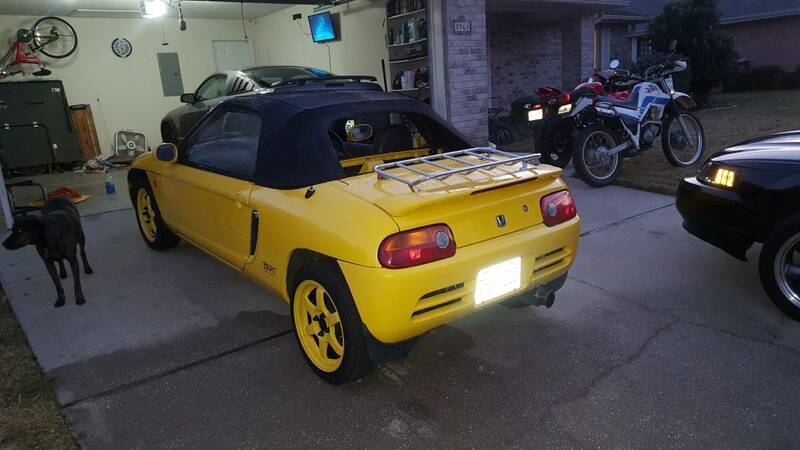 I bought a Beat from an auction just off the grounds of the 2018 Amelia Island Concours, thought I'd gotten a good deal at $6000 on one with 70,000 km. Problem is, I didn't inspect it prior to purchase as I arrived late to the auction and just trusted them to be honest. The turd they offloaded at my house across the state ran poorly, had a dying throwout bearing, check engine light, stinky exhaust, rattles aplenty and more. I poked around in the car and found a hidden compartment behind the driver's seat which contained the owner's manual - and a number of JDM receipts that showed the car had more than 185,000 km's on it before the odometer had been rolled back. The auction company resisted my angry requests for a full refund - but later gave me a partial refund as long as I signed a NDA to not reveal who they were. Point being: trust but verify. Take a close look at your potential purchase before making the plunge. Sound like they meant to say "This car is beat", instead of "This car is a Beat". Glad you got at least partial settlement. Did you keep the car?